I’m not one to clutch strongly to ideals, or entrench myself in unrelenting philosophies, but I am a creature of habit. Most of my web applications over the past year have been Angular based and I have certain proclivities to particular structures in my applications. My IDE of choice has been Visual Studio 2013, so I take advantage of it and .NET to serve up my base structure. In dealing with VS2013/.NET, there are some base mechanisms of which I take advantage. The ones I’d like to discuss are .NET bundling and Nuget. So, I structure my ~/Scripts folder to designate what my “app” scripts are and which “lib” scripts I have downloaded (either from Nuget or other sources). It makes a nice separation and makes maintenance, especially if handed off, easier. Here’s my usual folder structure. I find this to be pretty concise and anyone that takes a cursory glance, maybe with only a slight bit of foreknowledge would be able to make sense of it. 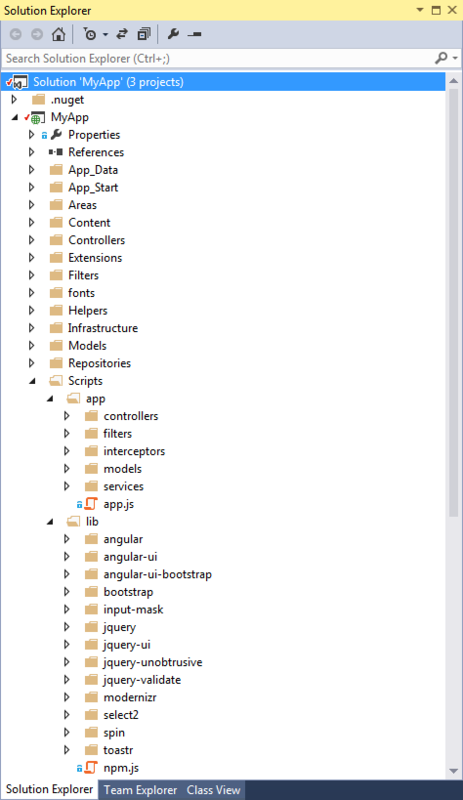 I also like using folders to segregate where my different Angular scripts reside. Without this bit of structure, I find that you wind up with a big jumble of files and searching/finding things becomes extremely tedious. Taking advantage of Angular’s built in methods for module definition and encapsulation is always a good thing too. ControllerAs syntax is a great feature of Angular so that we don’t have to refer to $scope nearly as much and our bound objects in our views can reference the controller by name. In our controller’s script attaching anything to “this” basically attaches it to the controllers scope. To make things readable, I usually assign “this” to a local variable called “vm.” This, in my mind, lets me think of everything I attach to vm as being accessible to my view. Thus, “this,” or “vm,” is effectively my view model and it makes an MVVM pattern more visible. In my controller or service, the model is just another dependency that is injected. A new instance can be created, and then we use it as part of our view model. That’s it for this post. As I said, these are general conventions that I follow, but if better conventions or ideas come along, I think it’s important to be able to recognize them and change if necessary.